I was waiting in front of Alipore Post Office – noticed a roadside thela on the footpath. The guy was making dosas & talking to customers in Bangla & Hindi. Suddenly another guy came & they started talking in Tamil………..and that…….increased my interest manifold. So I decided to check out what was on offer (assuming that if the Guy is Tamil, I can expect some authenticity). He was serving freshly made dosas, medu vada dipped in sambhar & idly stored in a jar. I decided on the freshest & asked for a dosa & started a conversation – The Guy is a Tamilian who migrated to Kolkata fifteen years back & started a small stall. 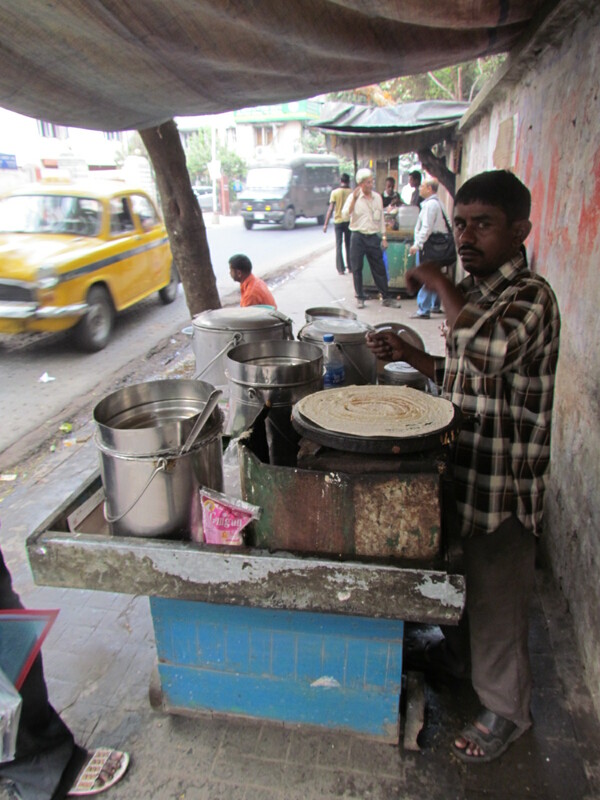 Slowly he started making little money & now he has a portable cart & stainless steel utensils to serve food in. A part of the food is cooked by him at his Dharmatolla home early in the morning & the rest (dosas) he makes & serves as per demand. He goes once in a blue moon to Chennai to attend what he termed as ’emergency’ like marriage, death, unwell relative etc. So he speaks Tamil, Bangla & Hindi with equal ease & has decide to make Kolkata his home. I opted for a plain dosa which he made in front of me. It was too good (my expectations were low anyway) – thick dosa but soft inside & crispy outside. However the crispiness was just right – he did not end up browning the dosa. The sambhar was hot & spicy but a little too watery texture. The chutney was however excellent. All this was served on a stainless steel plate that had compartments. Yes, I was given a spoon too & I got a shock of my life when he told me the price – Rs. 10!!!!!! I wonder how people who open posh restaurants like Kaustubh Saket Delhi cannot get their basics right & how talent is wasting on the streets of India. Usually eating a lot of rice based food shud help. If not, just chk with ur doc.